Tarai State Farm was transferred to Pantnagar University on June 1, 1961 by the Government of U.P. through a Deed of Grant 1896 with the objective of contributing agricultural education, research and extension and producing high quality seed. At present approximately 2377.34 ha. land is available with the University Farm which is utilized for seed production. For efficient management, the land is divided into three zones, viz. Western Zone (Matkota) with 217.91 ha, Central Zone (Haldi), 760.93 ha and Eastern Zone (Beni) with 1398.50 ha. Each zone is further divided in to blocks consisting of about 200 ha. each. At present, there are 11 blocks. Central Workshop, Haldi undertake repair and maintenance of agriculture implements, tractors etc. It coordinates the work of three service stations situated in each zone at Matkota, Haldi and Beni. University Farm produces large quantity of breeder, foundation and certified seed of major food grain, pulses and oilseed crops such as wheat, paddy, black gram, french bean, rapeseed, toria and soybean and orchards besides that of commercial sugarcane. The seed is supplied to U.K. Seeds and TDC, NSC. 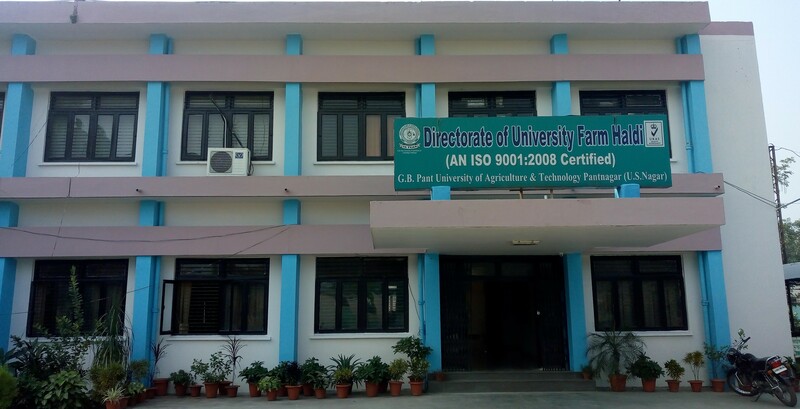 The University Farm is primarily engaged in the production of quality seed of different crops which has increased the production and productivity of crops, in North Indian states. During last year of farm produced approximate 8,681q. quality foundation, breeder and certified seed of crops. In addition to this, 76582q. of commercial sugarcane was produced and supplied to sugar units. Seeing its contributions the Noble Laureate, Norman E. Borlaug termed the Pantnagar Farm as the Harbinger of Green Revolution in India. Wheat- Timely Sown 50.60 q/ha. Lahi (as intercrop with Sugarcane) 12.34 q/ha. Lentil (as intercrop with Sugarcane) 7.89 q/ha. 1. General Varieties 57.33 q/ha. The activities of farm have been diversified for sustained long-term productivity. Incorporation of legumes during spring/summer season in rice-wheat cropping system, green manuring for soil health for sustainable production with sesbania/Sunhemp, orchards/ plantations, intercropping of sugarcane with toria and lentil, urd and mustard. Around 10,000 saplings of poplar, bamboo, litchi, and mango were propagated at University Farm for strengthening the economy of the farm. As per the directives of state govt. the farm management decided to rent out the some of land of the university farm to the farmers and seed growing agencies for seed production under contract farming programme and thus strengthening the economy of farm. The additional benefits realized through contract farming are the land development and reduced pilferage. Consistent improved management and timely operations helped in strengthening the economic status of University Farm. The total receipt of the University Farm is increasing over the years. The farm, being a predominantly commercial agriculture, is trying to improve its farming system and its productivity by adopting modern techniques and advanced agriculture equipment, IT tools and by inculcating team spirit among working community of farm. The productivity of farm has increased tremendously to the tune of 38-142% in different crops. Drip system of irrigation in direct seeded rice in collaboration with Jain Irrigation systems Ltd., has been established on one acre land area to save costly input water use in rice beside yield increase. This system is being extended to Wheat & Sugarcane crop as well. Farm has improved one step forward by getting it accredited with ISO 9001-2000 & 9001:2008 and become India’s first ISO certified seed production farm and inching towards establishing it as Model Hi-Tech Farm. For the sustainability of soil and keeping the environment clean burning of crop residue at farm is prohibited. It is being incorporated into soil or being used for straw making with the help of reapers. The rice and sugarcane residues/trash is also being used as a source of renewable energy by conserving it into full brick. For this trash is being baled. Land development work is being undertaken for sustainable production and about 30 acres land has been developed along the rivers/rivulets passing through farm.